In April, 20 Augsburg MBA students led by Professors Magda Paleczny-Zapp and Steven Zitnick embarked on a 9-day international experience to Santiago, Chile. The purpose of the trip was to expose the students to the thriving business climate of Chile and to allow students an opportunity to understand the culture and environment of a South American country that has built a stable, just, and democratic society after nearly 30 years of unrest. Students had an exciting week that alternated visits to and with business leaders from Nike; RBS Chile, The Royal bank of Scotland; AgroSuper, a large food processor; a representative from the Chilean Foreign Investment Committee; and an executive from Sonami, Chile's largest mining association. The students also visited the De Martino Vineyards, a large modern winery that has been family owned for over 75 years. 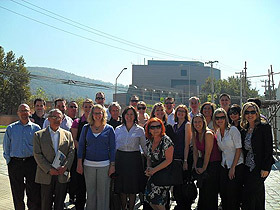 The students ended their visit with a daylong excursion to Valparaiso, Chile's primary seaport. Students were enrolled in two MBA classes with approximately half in MBA 545: The Global Business Environment and half enrolled in MBA 595: Strategic Management. Students met in class sessions before the trip, during the trip, and will meet again in May. Students in both classes were assigned appropriate projects that will enable them to leverage their Chile experiences. Future faculty-led international experiences will include a trip to Moscow, Buenos Aires Argentina, and potentially China. In the future, Augsburg MBA students will be able to plan on at least one opportunity for an international experience while they complete their 23-month program. The trip was coordinated by Austral Group, a company that arranges university and college MBA tours in Argentina, Brazil, Peru and Chile.